Service With a Smile: Le Pot au Feu's French cuisine consistently rates above average for its price range. A DECADE-LONG consistency has its rewards. For Le Pot au Feu Restaurant, practically a landmark in downtown Menlo Park, one reward is the large contingent of patrons who drop in for a meal as easily as people do for burgers. Behind unassuming storefront windows, the restaurant feels only marginally like a French restaurant. Not much in the way of ornate decoration pampers the segmented dining rooms furnished with hard, cushionless bistro chairs and a few upholstered booths. Bright flowered wallpaper, a scattering of paintings and mounted sconces hint at a country ambiance. Table candlelight warms the room, making it feel a shade less like a deli. The restaurant is an easygoing place where diners feel comfortable ordering a one-course or a five-course meal. Many choose meals smaller than the standard four courses, perhaps because the menu has not changed much over the years: four appetizers (baked brie, escargot, French onion soup and pâté), four salads (house, goat cheese, Caesar and romaine) and a dozen entrees, including the day's special. Beef Wellington, roasted duck with blackberry coulis, veal sweetbreads, rack of lamb and grilled halibut dignify the bill of fare as regulars. Our first course consisted of crab cakes ($7) and country pâté ($5.25). The latter seemed on a par with most deli selections. Neither the house-made herb croutons nor the fresh tumble of vinaigrette-accented greens could countrify this pâté. A triad of petite crab cakes, seared to crunchy blackness, punctuated a sweet cilantro cream sauce to effect light, playful flavors wholly different from the standard lobster aioli that has lately become the rage. When our frazzled waiter brought our main entrees, he was mortified that somehow he or the kitchen had forgotten our salads: warm goat cheese with baby greens ($5.95), and hearts of romaine with pears ($5.95). Rather than risk traumatizing him, we canceled the salads (he heaved a big sigh of relief and said "OK" without apologies). We then forged ahead with the meal, as a reheating would not do the quails justice. Although the missing salads dampened the meal, our decision was correct: The roast quails ($17.95) proved to be at their point of perfection. A duet of exquisite birds, fattened with chopped apple and shiitake mushroom stuffing, took center stage atop a liquid cape of dark crimson cognac truffle. Crusty from the roasting, the skin protected a moist, rosemary-infused meat that paired gloriously with our half-bottle of Steele '95 Pinot Noir ($16). Short-grain saffron rice, the quails' sole accompaniment, faltered sadly, for its faint starch and lusterless bouquet could neither harmonize with nor amplify the depth of the truffle sauce. An additional side of vegetables or yams would have added dimension to this course. 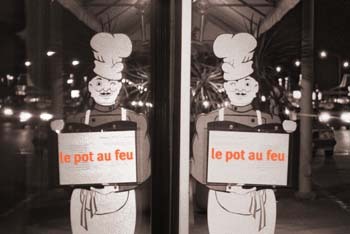 Le pot au feu ($14.95), the namesake of the restaurant, arrived at the table in a deep soup bowl, a true French peasant dish. A thick cut of beef short ribs shared the bowl with a grilled chicken breast, rather tough and bland, and an eighth-wedge of cabbage. The kitchen simply boiled the ribs and added the vegetables at serving time. A jar of gherkins, a shaker of sea salt and a crock of Dijon mustard accompanied the soup. Overall, an unsophisticated, mild dish for those who are in the mood for a brothy stew or who don't mind fat on the short ribs. For dessert we selected a trio of sweets: crème brûlée ($4.25), warm apple tart ($4.95) and pecan chocolate cake ($4.95). The caramel sauce velveted a moon of pastry laden with gossamer, cinnamon-gilded apple slivers. A cloud of whipped cream finished a confection that was flaky and scrumptious without being sugary. Likewise, our other two choices couldn't have been better. Pecan crumbs lent a nutty crunch to a petite slice of chocolate cake wading in a sun-yellow pond of crème anglaise--a mellifluous blend of vanilla, chocolate and pecan. Equally luscious was the crème brûlée. Glazed to a candied crunch, the sugar top capped a terrine of butter-smooth custard. Every spoonful was appreciated with "decent" coffee. Although our waiter this time ranked closed to dismal, we had on previous occasions enjoyed more attentive service here. The food consistently rates above average for its price range. But the real reason we return is the establishment's casualness: We feel comfortable ordering light one-course meals--a rarity at most French restaurants. Le Pot au Feu makes good bistro-style French cuisine accessible.